I’m just going to say it- I love Tuaca. My partner in crime (Bunniey) and I discovered it in our early 20s, and life has been that much better since. It is a vanilla citrus liqueur, but it is brandy based and 35% alcohol. This makes it the same strength as most liquors, so beware that it is much stronger than the “liqueur” in the name implies. It’s good in pretty much anything, but this is my go to cocktail. Cut your lemon into eight wedges (or four if it’s a tiny lemon). Muddle three wedges. If you do not have a muddler, you can use anything to smash the juice out of the lemon. Try a wooden spoon or the handle end of another cooking utensil. If you just really don’t want to muddle, you can use lemon juice instead (about half an ounce, to taste). 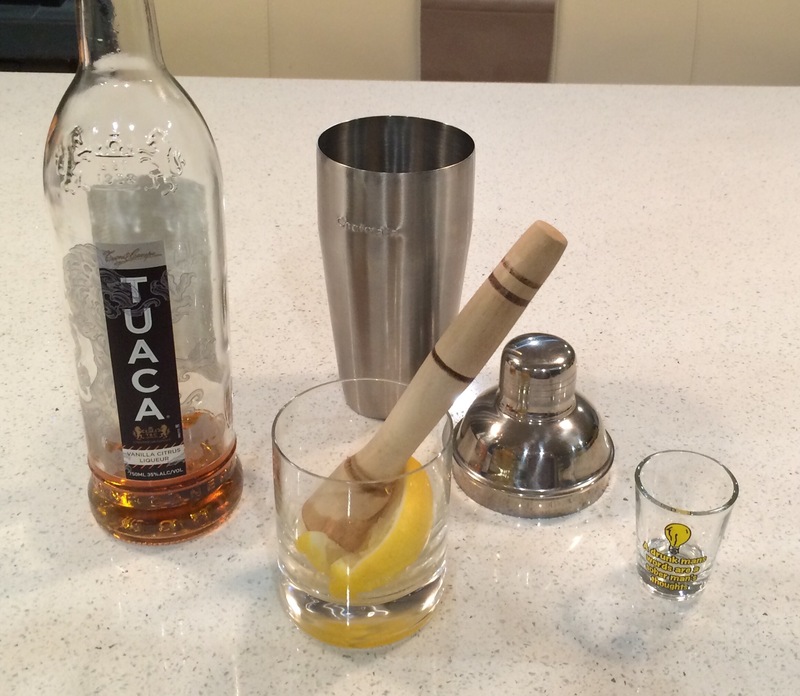 For the best mix of flavors, pour this into a shaker (you can leave the lemon peels in for extra flavor and more of a mojito look) with the Tuaca and ice, then shake. Pour everything into a glass and garnish with a lemon wedge. You can also stir all of the ingredients, it’s up to you. If this tastes too strong for you, add some lemonade or soda water. For a mocktail, you could try adding the muddled lemon to a vanilla cream soda, and add a dash of orange juice. The cocktail is a sure shot winner. Thanks! It’s possible I need more focus, but I sometimes have a short attention span! 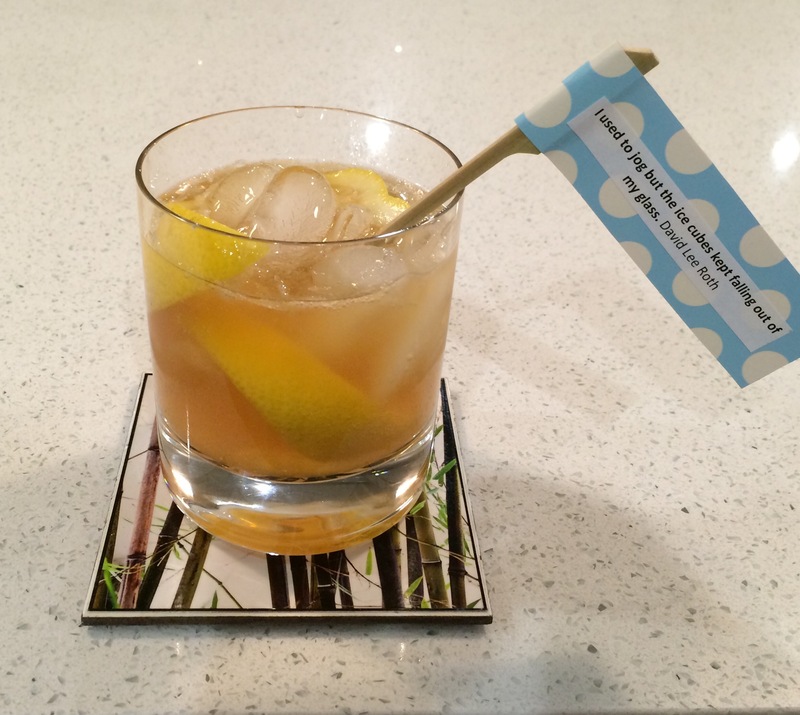 Did you really say “If this tastes too strong for you…” your funny a drink can never be to strong LOVING your blog! Making this tonight. What’s a good snack to serve with it? Can I make it by the pitcher? Cheers to Tuesday! 🙂 Oh, I don’t know… sometimes friends get taken aback by my cocktails. When I made mine for this picture, I sipped it while making dinner. I think it would be awesome with a hummus platter. I’m getting hungry! As for by the pitcher, I don’t think that would be a good idea. I think it’s probably too strong. To prep for a party, I think what I would do is pre-squeeze the lemons and keep the juice in the refrigerator to make them quickly.